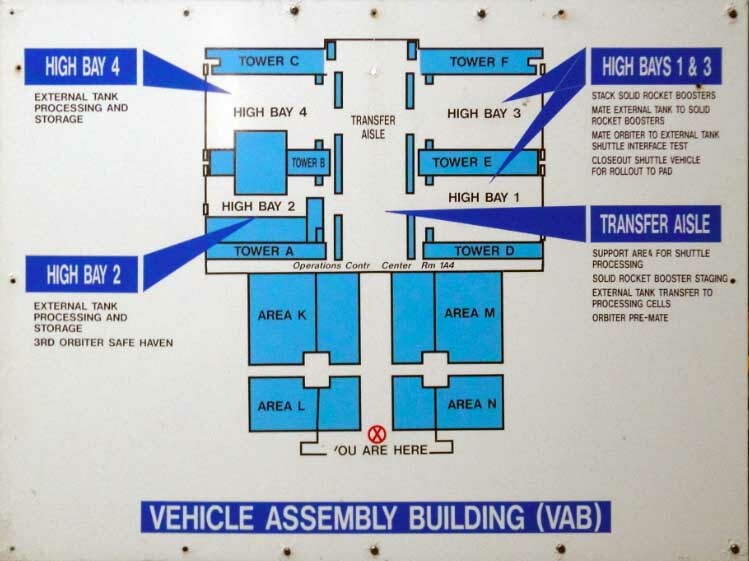 Shuttles always returned on landing to one of four hangars which were offically known as Orbiter Processing Facility 1, 2, 3 and 4. 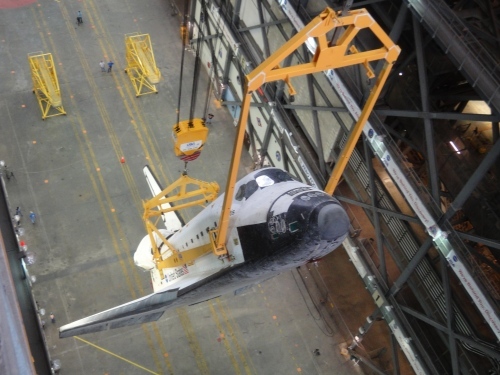 In the OPF the shuttle was serviced, repaired as necessary and readied again to fly in space. 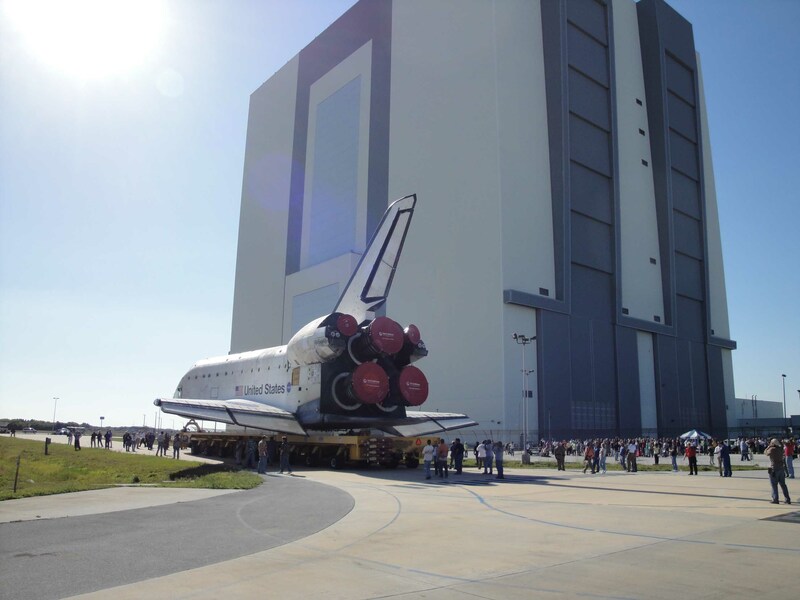 Movement of the shuttle first was from the OPF to the Vehicle Assembly building several hundred yards away. This movement was called "the rollover" and took several hours. 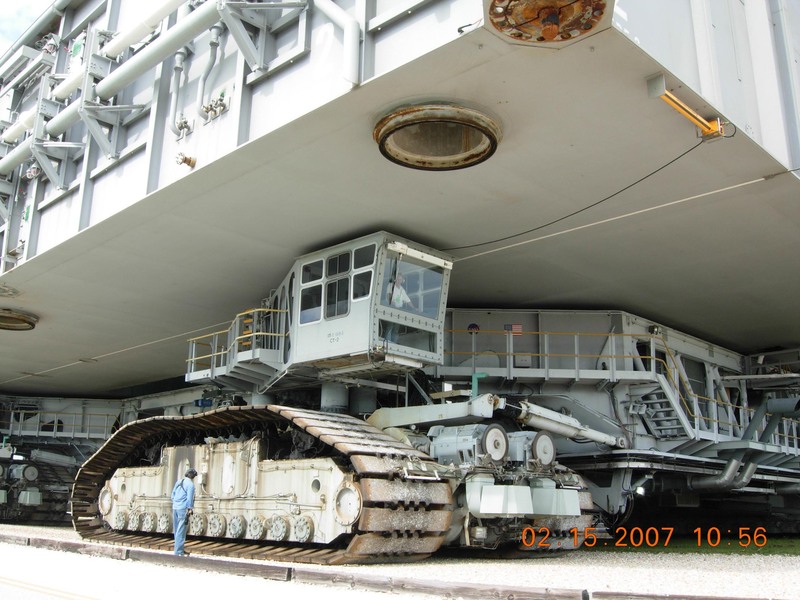 The shuttle was transported on a carrier that was driven by a driver. Entering the VAB the shuttle was in the Transit Aisle, a room which extends to the top of the VAB more than 500 feet and 40 stories high. 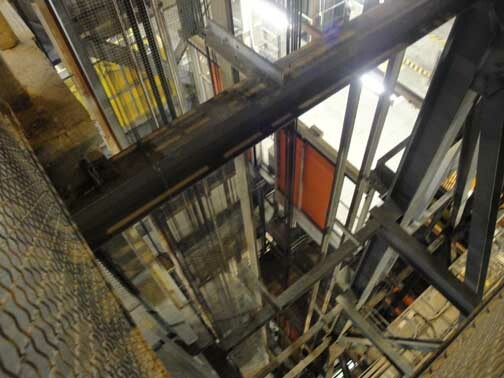 Carol Anne Swagler's Shuttle photograph from a 16th floor catwalk in the VAB. 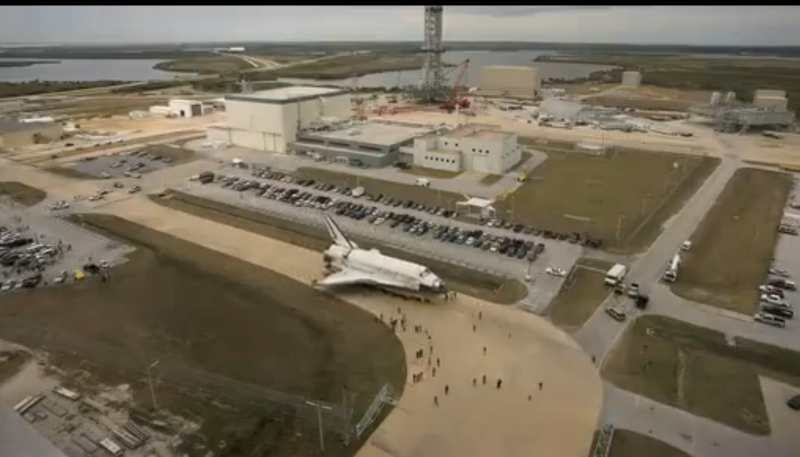 As lifting of the shuttle begins, the shuttle seems to takes flight. Once she is upright, she hangs above the Transit Aisle for hours. On the Transit Aisle, the shuttle is harnessed and then turned on end. It is allowed to hang there for hours until it completely settles and stops swaying. 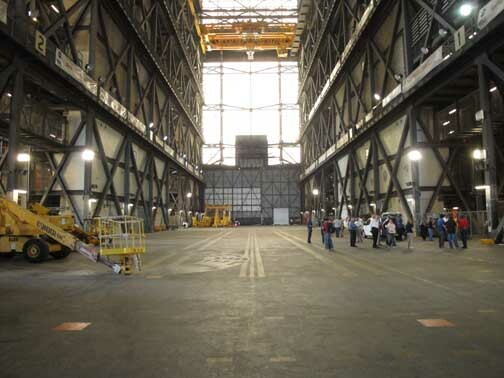 Then it is slowly lifted 500-feet to the ceiling on the VAB. 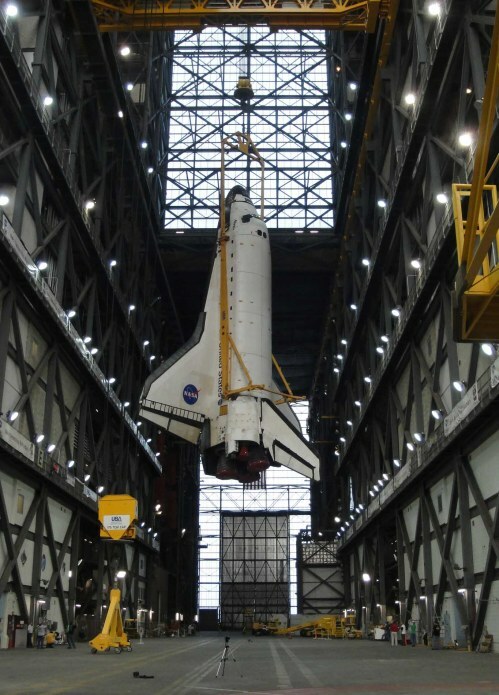 Pete Crow's Shuttle photograph showing the Atlantis after being moved directly over the 5-story high Crawler/Transporter in VAB High Bay 1. 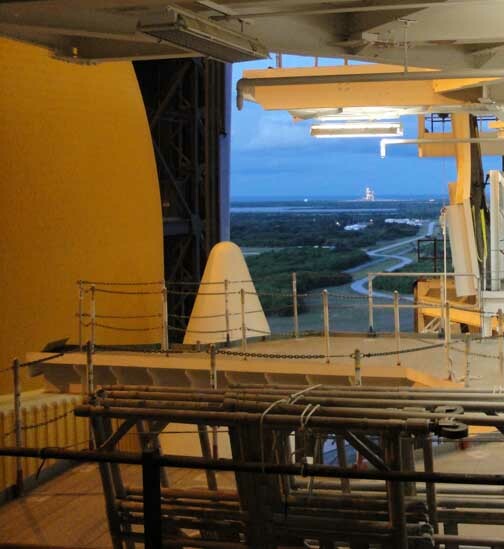 This photo was taken from a catwalk on the 16th floor of the VAB. 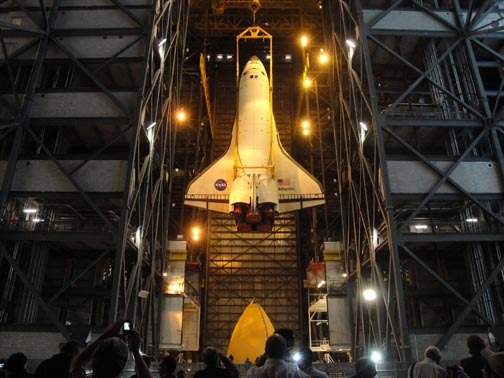 The most difficult and occasionally time-consuming step in the "Lift (the shuttle) to Mate (the shuttle with the Transporter/Crawler) is lowering the shuttle precisely onto the Crawler to enable its being secured onto the Crawler/Transporter. 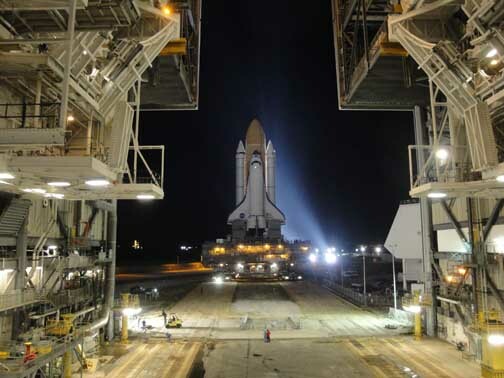 Once the shuttle is secure, the Crawler begins moving out of the VAB, as shown here, toward the Launch Pad at the rate of 1 mile and hour. Once outside the VAB, the Crawler turns onto the Crawler way, two strips on Alabama river rock separated by a green center median. The Crawler way leads to both Pad 39-A and Pad 39-B, branching several miles down the Crawlerway. 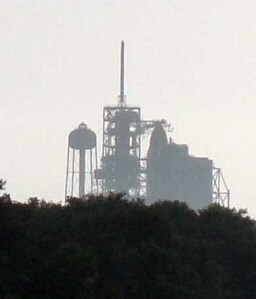 In the final missions only Pad 39-A was used. 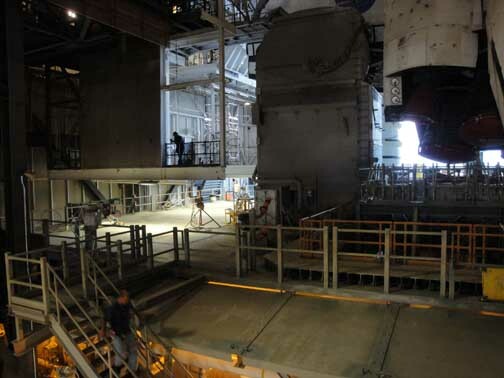 Pad 39-B was torn down and demolished in May and June 2011 to begin to prepare it for Constellation, the next US manned space program. 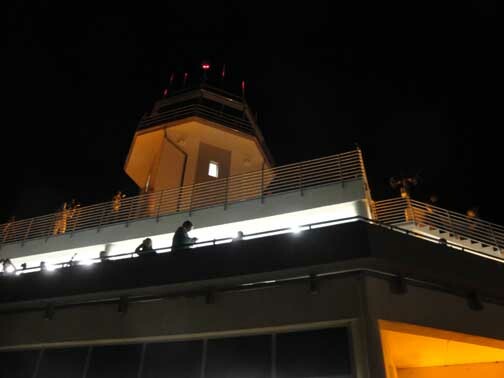 President Obama canceled Constellation after millions had been spent, but the outcry was so great he reinstated it. More money was spent and then Mr. Obama canceled it again. 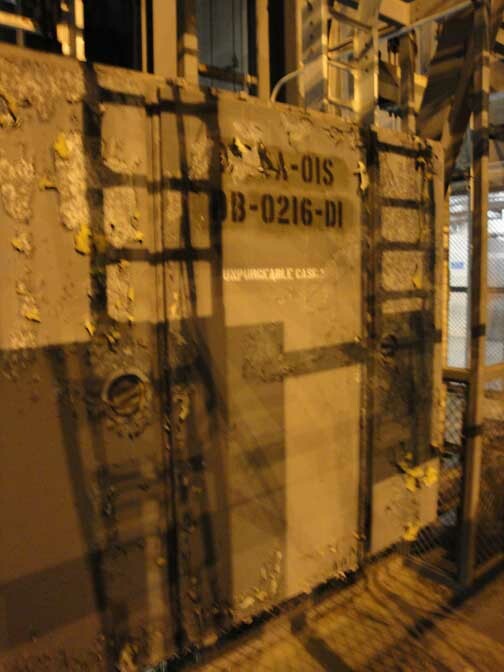 All that remains is a 1960s-esq capsule that resembles Apollo called Orion. 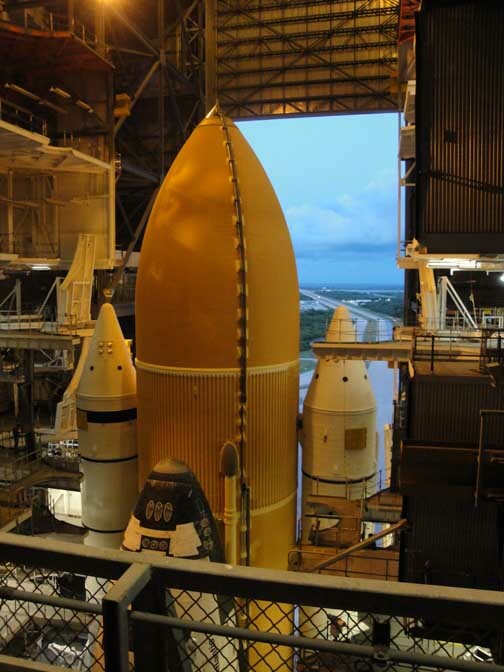 Orion is a capsule without a rocket to get it into space and no one will say when a rocket for it will be announced. 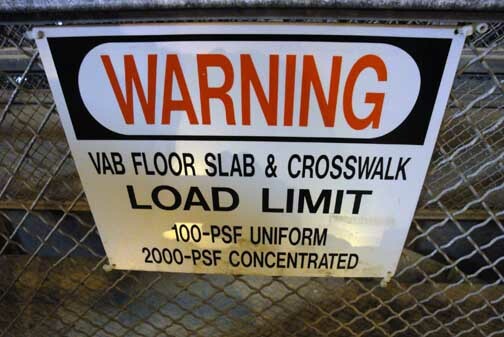 The Crawler is five stories high. 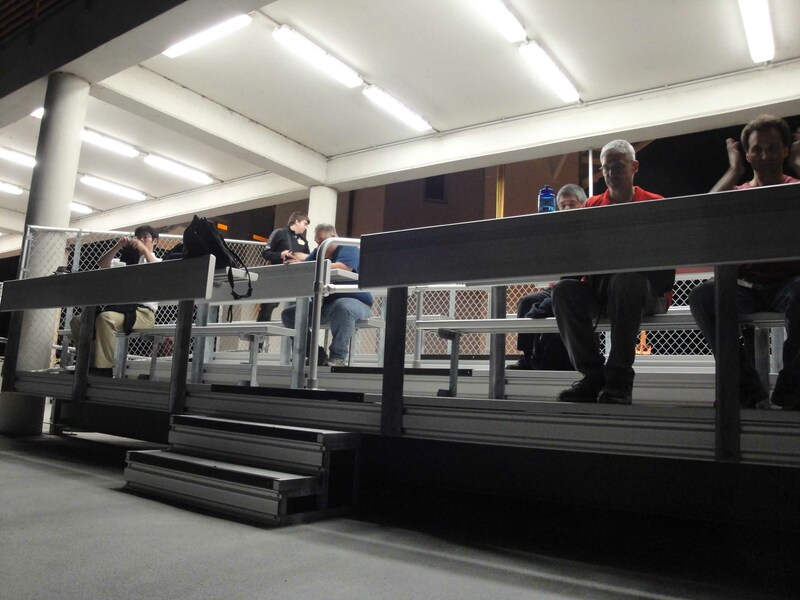 To gauge the size of it look for the man in this picture besides the track (bottom center). 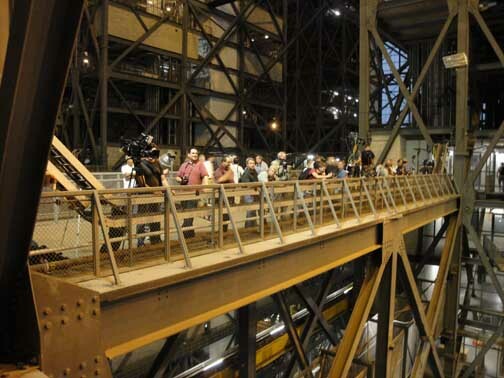 For many years NASA invited selected members of the press to walk with the Crawler from the VAB to the Pad. 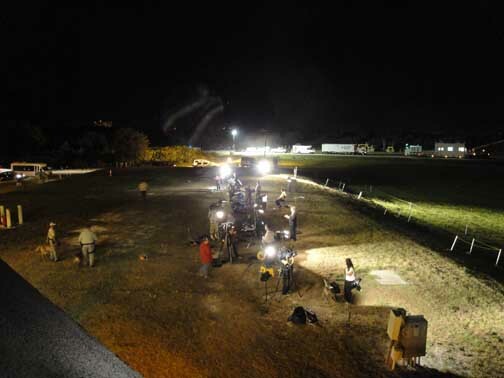 As the program neared an end, the shuttles were commonly moved at night and it was deemed too dangerous to allow the media to walk with the shuttle any longer. 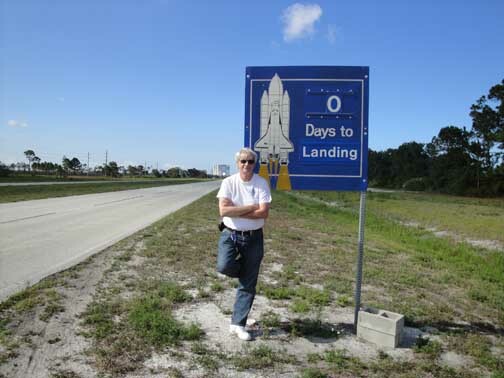 Carol Anne Swagler, Grove Sun Daily, walks far ahead of the shuttle and stands on one of the twin rock highways on which the shuttle traveled. 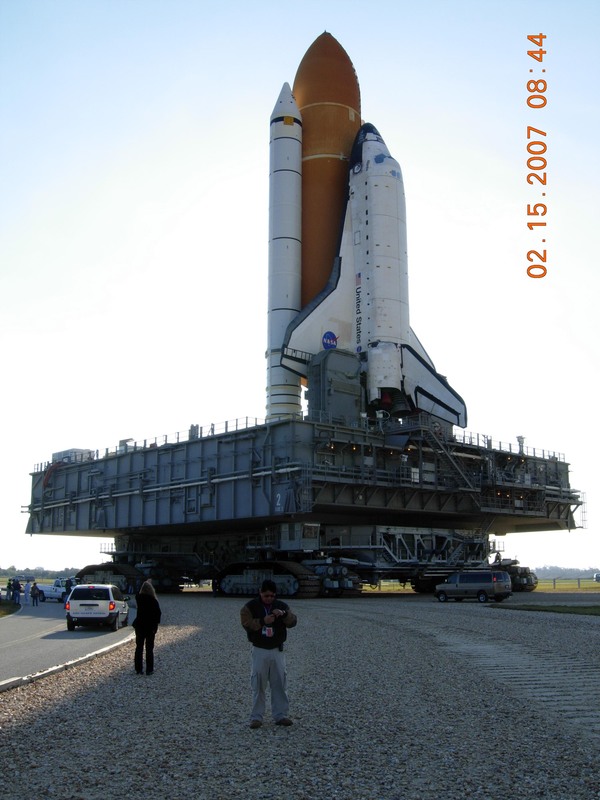 The Crawler and shuttle were so heavy the rocks on the highway were crushed each time and had to be replaced. 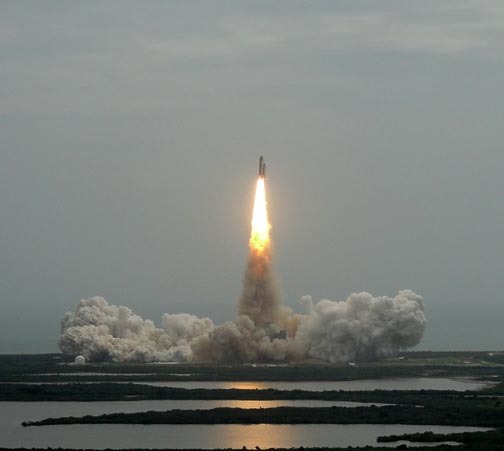 Nothing about the shuttle program was easy or inexpensive. 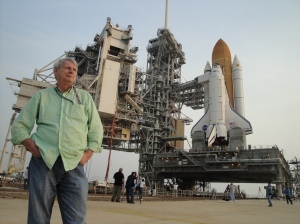 Pete Crow and the Shuttle Atlantis days before her final July 8, 2011 launch. 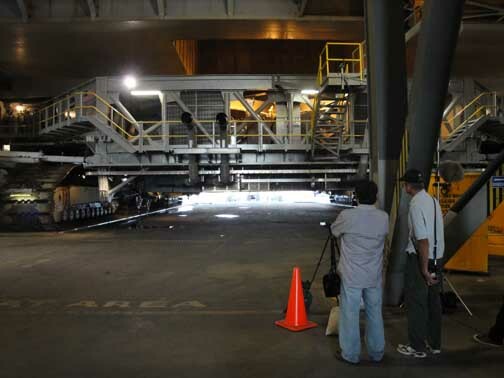 Once at the Pad, the payload for the shuttle is brought to the pad and lifted up onto the Rotating Service Structure, directly behind Pete Crow. 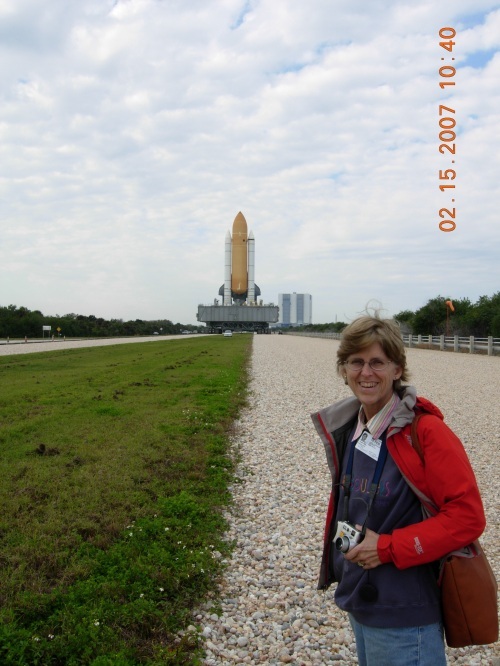 The payload for STS-135 is in the white rectangular box over his left shoulder. 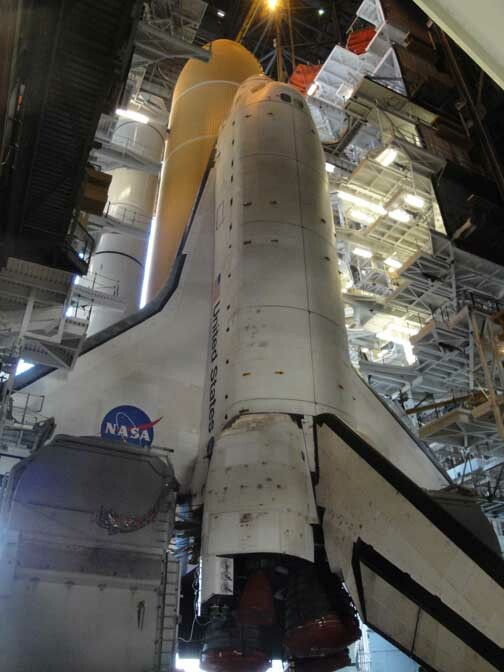 When ready, the shuttle's payload doors are opened and the RSS is rotated until it covers the shuttle. 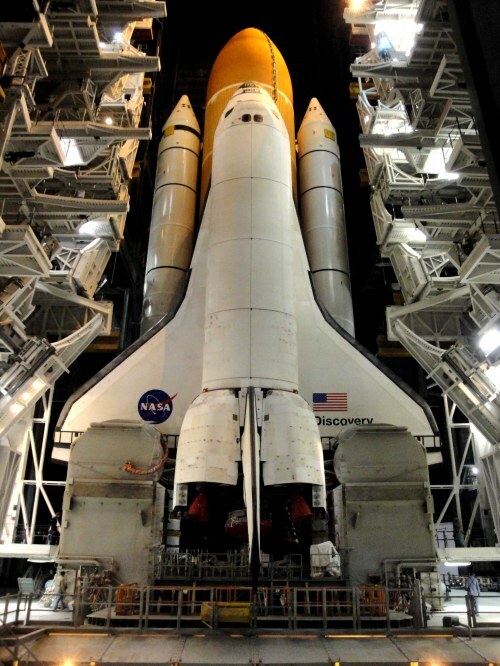 The payload is then secured in the shuttle's bay. 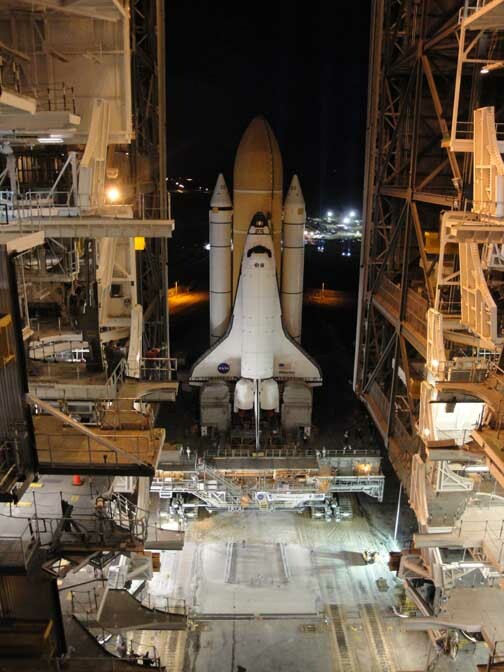 The RSS remains mated with the shuttle until about 18 hours before launch. Then it is retracted -- rotated more than 90-degrees leaving the shuttle alone on the pad, and ready to be fueled about 9 hours before launch. 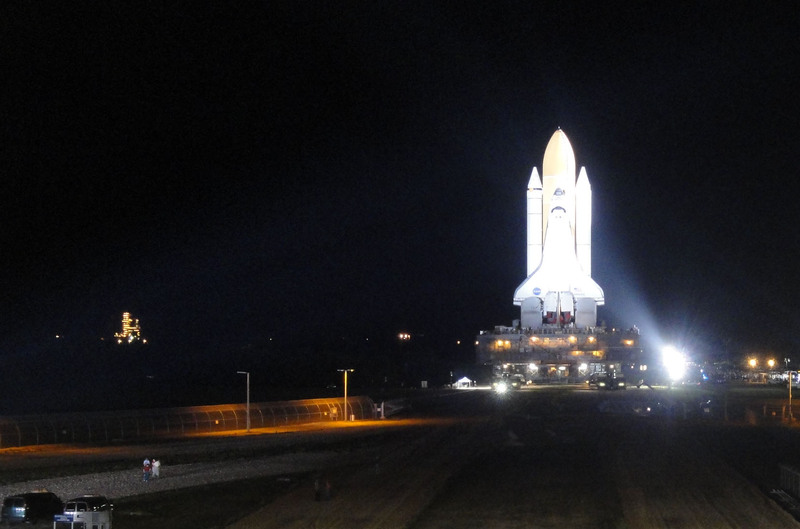 The RSS has been fully retracted and the shuttle is ready to be launched. 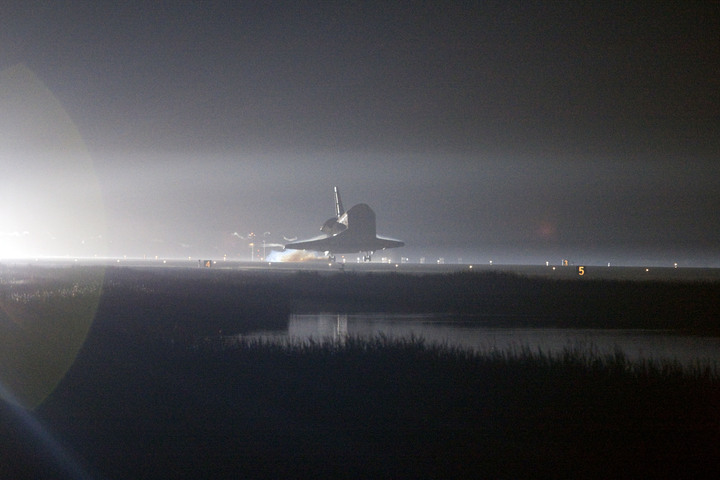 This is Endeavour awaiting launch on STS-134, the second to last shuttle mission. Retraction is a popular press event unless it rains. 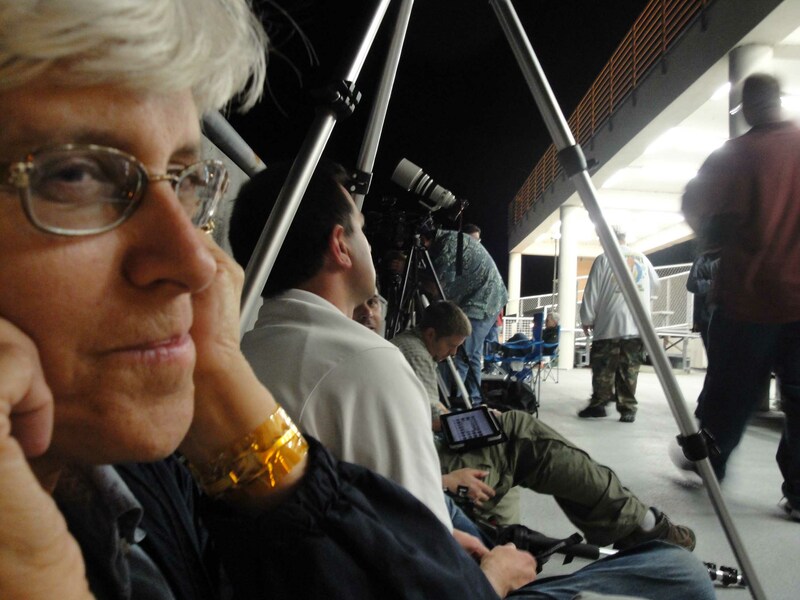 Few photographed the retraction of the final shuttle mission, STS-135, on the afternoon of July 7, 2011 because the time for retraction was repeatedly shifted due to weather, and because weather at the Pad was often a driving rain and it was muddy. 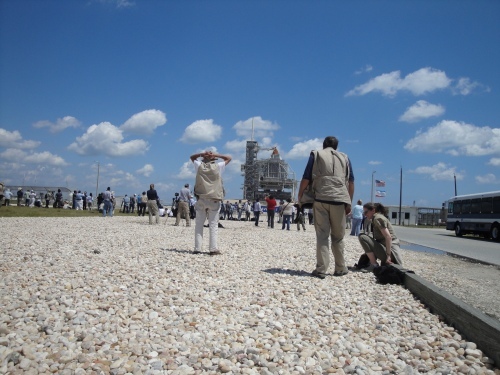 Retraction was more easily enjoyed by watching it on NASA-TV from the comfort of the Pad 39 Press site. 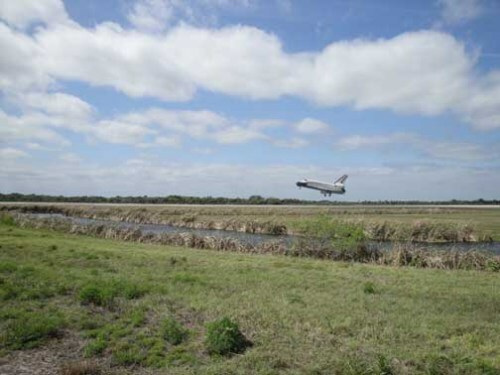 Kennedy Space Center adjoins a wildlife sanctuary, Merritt Island, on the eastern shore of the Atlantic Ocean. Dawn here is often beautiful as it was on the blustery morning of July 8, 2011, when Pete took this photograph of the Atlantis on Pad 39-A. 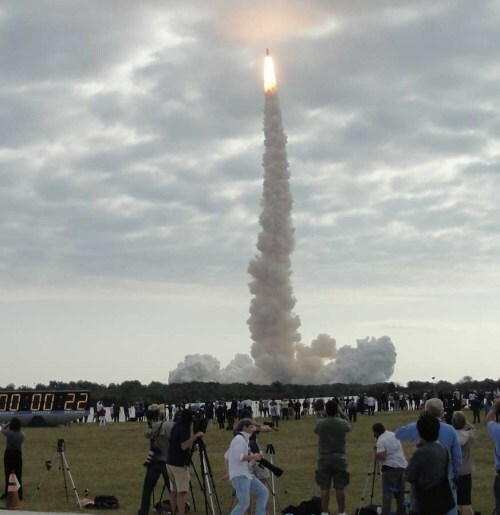 Pete Crow shuttle Atlantis photograph from the roff of the Vehicle Assembly Building seconds after lift-off. 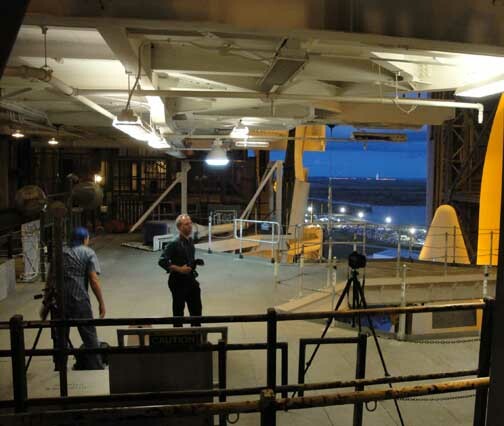 There are only a handful of photographers allowed on the VAB roof for safety reasons, but Seine/Harbour® and The Grove Sun, Grove, Oklahoma, were granted two of the less than 40 spaces on July 8, 2011. 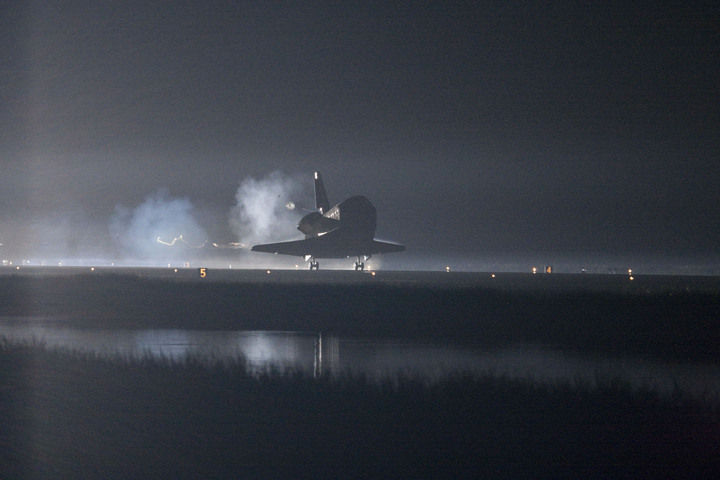 This is Endeavour being launched on STS-134 on May 16, 2011. 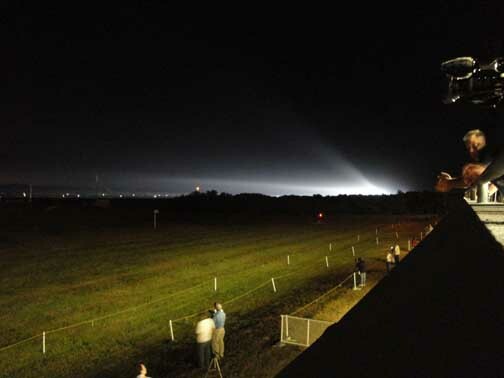 The view is 22 seconds into the launch and was taken at the Media Press site. It shows a strikingly different perspective than the picture directly above taken from the VAB roof. Once launched the astronauts are in subjected to three+ G's (three times the weight of gravity). It doesn't last long. 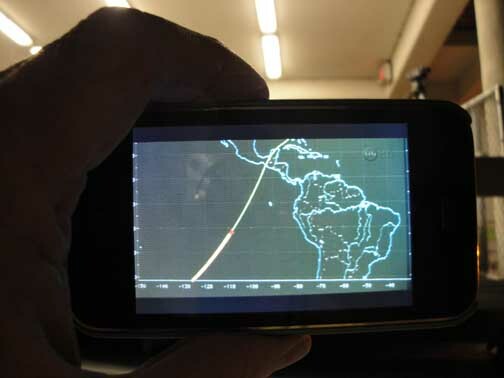 Eight minutes after launch the shuttle is over Africa and in space. And the astronauts are weightless. 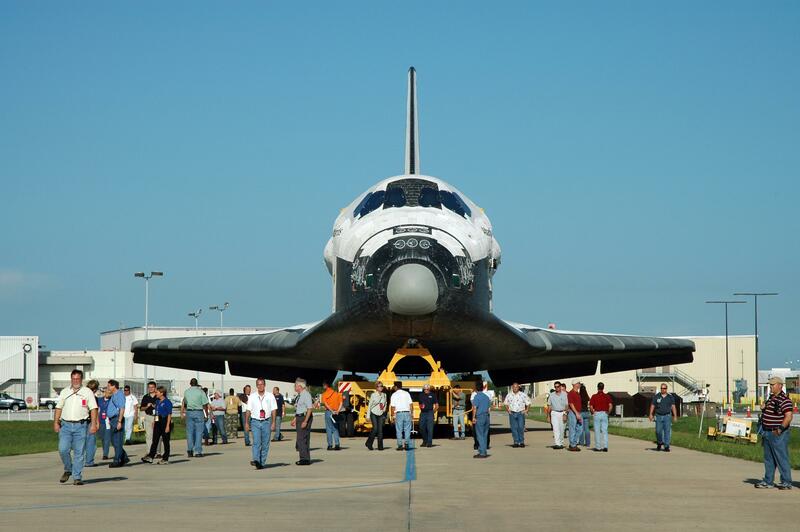 Later shuttle missions lasted 12 to 14 days. 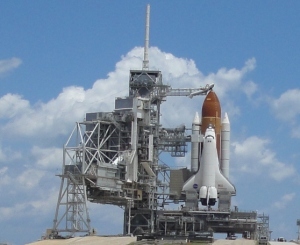 The shuttle has to watch its energy reserves which drive the electrical which drives its computers. 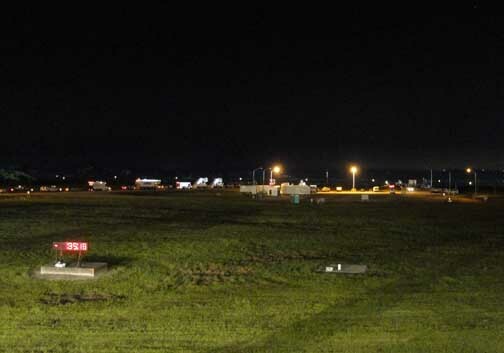 Generally, the shuttle undocks two days before landing from the International Space Station (ISS) then re-configures its orbits for landing in Florida. 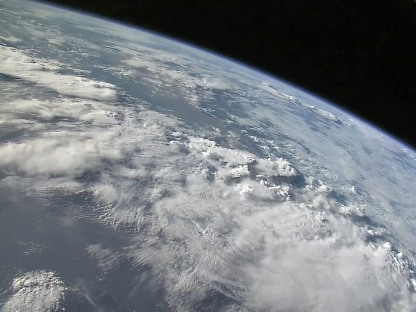 Landing begins with a de-orbit burn on the other side of the world, commonly over the Indian Ocean. 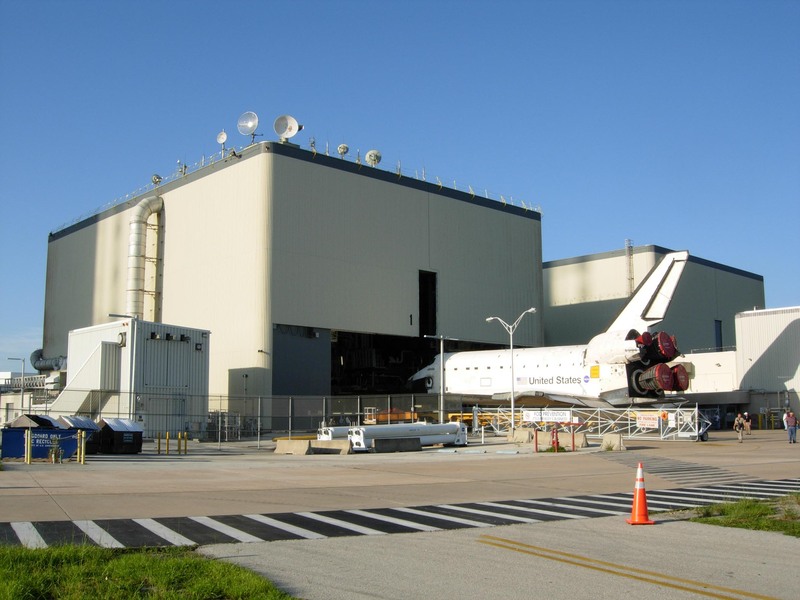 Once the de-orbit burn is exectued about 60 minutes from landing, the shuttle has no where else to go except to the tiny Shuttle Landing Facility (runway) at Kennedy Space Center. 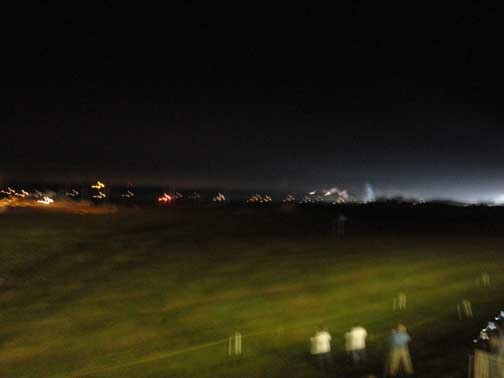 This photo, taken by Pete, is of the final landing of Discovery and was taken on the northern end of the runway. .”petecrow/NASA” © 2011 by / Peter M. Crow and the Peter Michael Crow Trust and by Seine/Harbour Productions, LLC, Studio City, California. 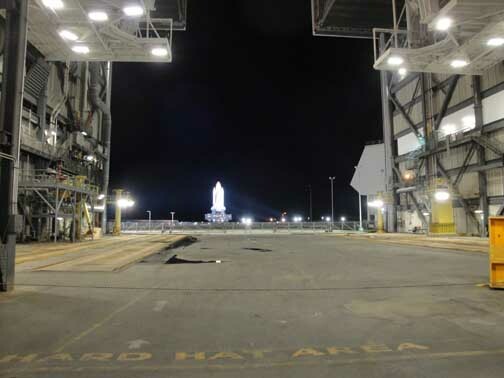 By 9:30pm, Tuesday, May 31, 2011, the Shuttle Atlantis was out of the Vehicle Assembly Building on its way to Pad 39-A, visible at the left side of this picture. Final Shuttle Mission == NASA is advising that they plan to move the shuttle Atlantis from the OPF (orbiter processing facility: the hangar where the shuttle is prepped) to the VAB (vehicle assembly building) beginning at 8 am Tuesday, May 17, 2011, if the Shuttle Endeavour / STS-134 mission launches as scheduled on Monday, May 16, 2011. This is called a “rollover” and takes several hours. 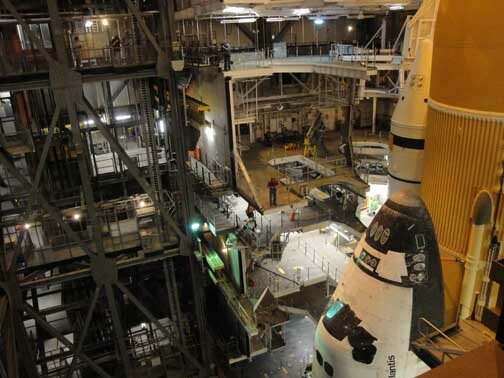 In the VAB the shuttles are mated with their booster rockets and placed on the Crawler. 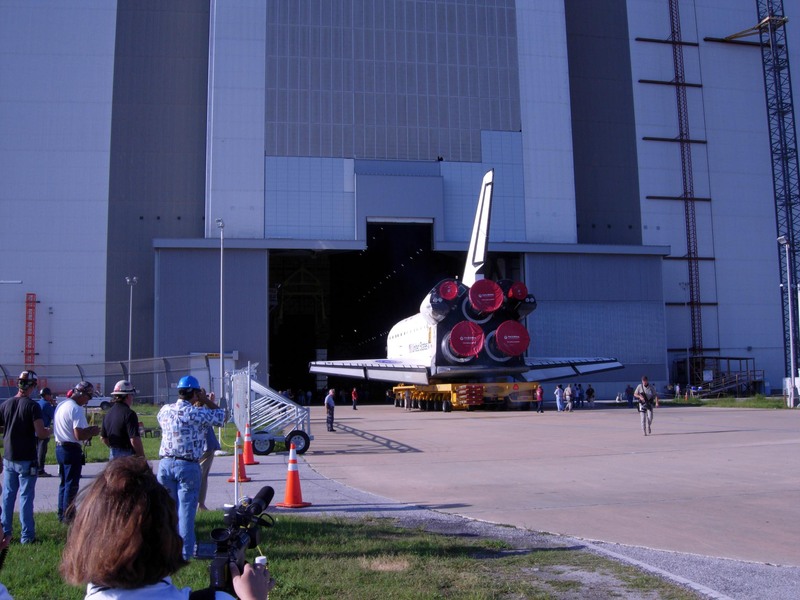 When a shuttle is moved from the VAB to the launch pad, that is called a “rollout”. 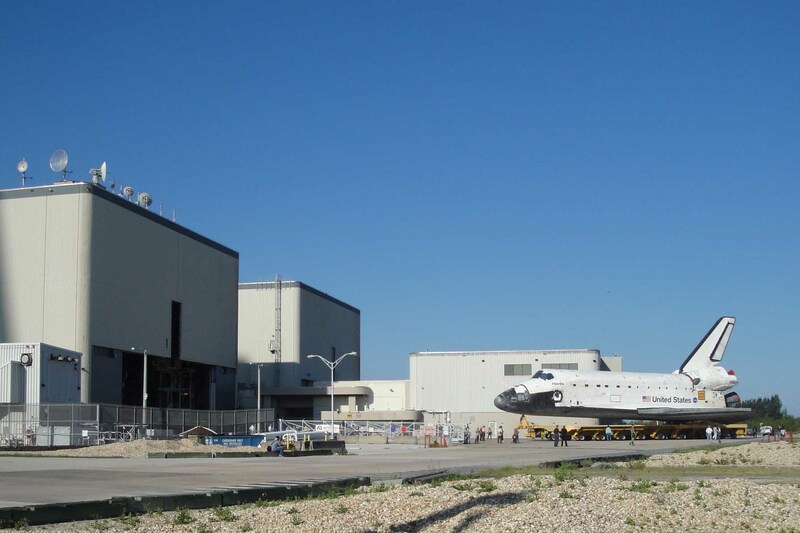 Atlantis is scheduled to launch no earlier than June 28.